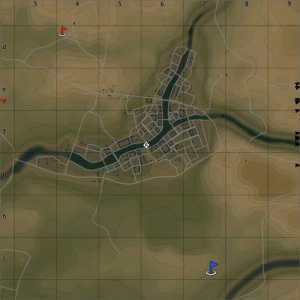 European Province is a ground forces map available in all modes, using the same map as the Eastern Europe map. It was added in Update 1.77 "Advancing Storm". 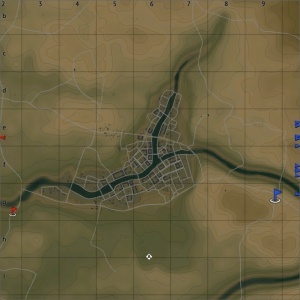 The difference between this map and the Eastern Europe map is that the battle area has been significantly increased; whereas on Eastern Europe the battle area is restricted to just that of the town and a small section of the surrounding area, on this map the battle area is most of the full map (seen to the right). 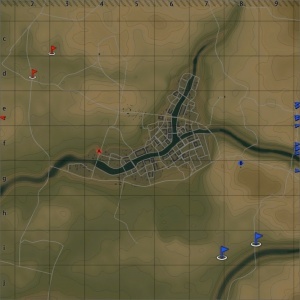 Combat in the town is pretty much the same as on the Eastern Europe map. The increased battle area allows the fields around the town to be accessed, players can engage in long range combat shooting at other players in the fields on the other side of the town. 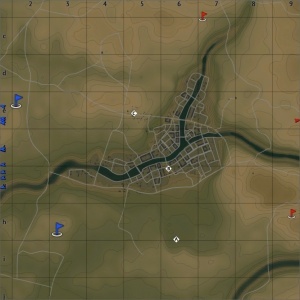 The fields are generally pretty open with little cover, however there are clusters of farm buildings dotted across the map, and tree lines help break up the map and provide cover for players. There is a large farm in the fields south of the town, which is often used either as a capture point, or a spawn point for one of the teams. See the Eastern Europe map article for historical information. There are three Capture Points. 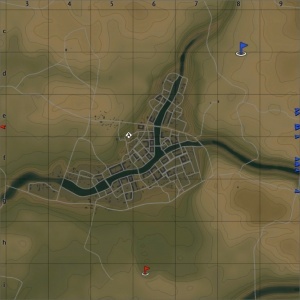 Point A is in the farm in the south of the map, B is in an open area in the middle of the town, and C is among some buildings, next to the fuel depot, north of the town. There are three configurations of the conquest mode, each with one Capture Point. The point will be either on a bridge in the middle of the town, in the farm to the south of the town, or in the north of the town. There are two capture points, each owned by one of the teams. Point A is at the very west edge of the town and B is around a farm building east of the town.